Today in Masonic History we discuss Anderson's Constitutions. Anderson's Constitutions was the original guide for Freemasons who were part of the Grand Lodge of England. The original Anderson's Constitutions was published in 1723. It was written by James Anderson, a Presbyterian clergyman, at the request of John Theophilus Desaguliers, the third Grand Master of the Grand Lodge of England. 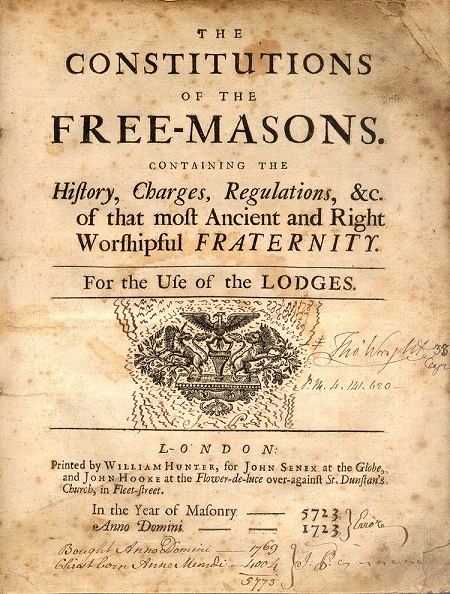 There are three sections to Anderson's Constitutions, the history of Freemasonry, the Charges or general rules to be followed by Freemasons and Payne's Regulations. The history section of Anderson's Constitutions, is largely written by Anderson who interpreted previous histories that were available. It was the most extensive history of Freemasonry to that point. It was in his history that Freemasons were cast as Noachides, followers of the Seven Laws of Noah. The Charges section includes various standards for the Freemason, both inside and outside the lodge. This includes such things as how to behave during a meal and a section on how to view a brother who has decided to rebel against the government of his nation. The final section was written by George Payne who was the second Grand Master of the Grand Lodge of England. He was Desaguliers' predecessor and successor running for a second term in 1720. It was in the 1720 term that he wrote the regulations that appear in the Anderson's Constitutions. Some of the regulations included how to constitute a new lodge. Anderson's Constitutions has been compared in places to the United States Constitution. In it, as far as the regulation of lodges, there are clear comparisons with freedom of speech and the right of the citizenry, or in the case of a lodge membership, to vote. Anderson's constitutions was reprinted in several countries and in different languages. With each printing items, particularly related to the history of Freemasonry, were taken away or added. A pocket version of the constitutions was also published, which Anderson himself did not like. A copy of Anderson's Constitution can be found here.